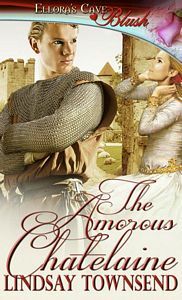 Candy at Single Titles has given my medieval historical romance, 'The Amorous Chatelaine' a 5 Stars review. Lindsay Townsend gives the reader a sweet love story about a woman who thinks her love life is over and the man who rekindles her passion. Emma lives happily with her warrior women, spending her time improving the lives of young knights. She does not realize that something is missing from her own life until she meets Sir Robert. He challenges her and makes her look forward to each new experience. When someone tries to take away everything she worked so hard to build, Sir Robert is at her side willing to fight for her. Is Sir Robert the man who will make Lady Emma live again? Five Stars.